There’s just something about tulips. They’re cheery and welcoming, aren’t they? 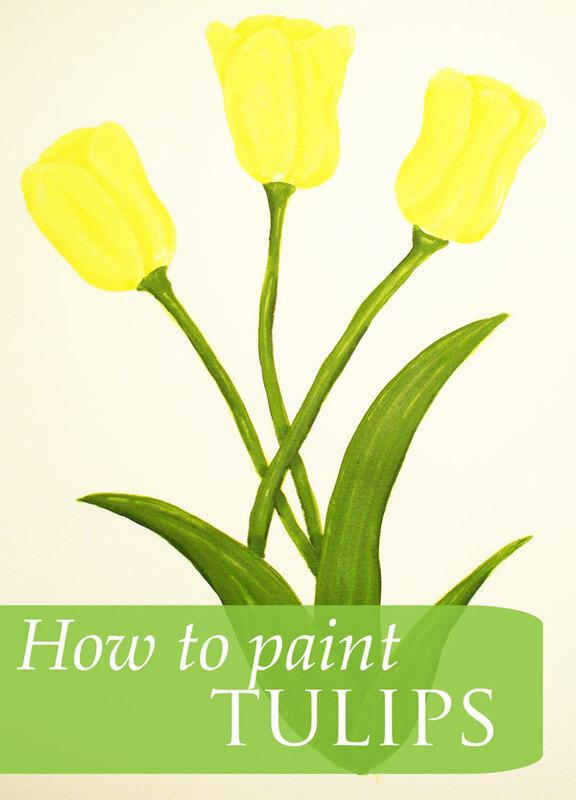 I thought you’d enjoy this simple How to Paint Tulips tutorial. 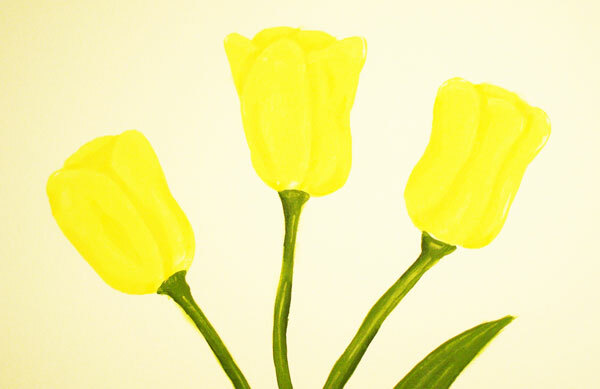 We’re using craft acrylic paints which, you’ll see, make for an easy painting. Click on the photo above to get the pattern. It might also make a fun coloring page for the kiddos! Only a few paint colors are needed. Full supply list is at the bottom of this post. If you’d rather paint a different color than yellow, you can. Just pick a midtone and a couple of shades darker and you should be fine. Step 1 – Download the pattern and print it then transfer it to a piece of watercolor paper. 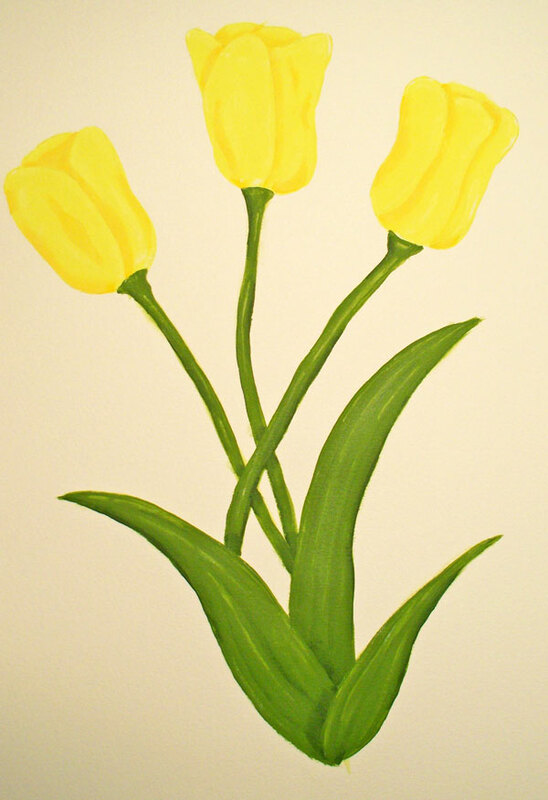 Step 2 – Basecoat the tulips with Canary Yellow and the stems and leaves with Leaf Green. I like to use a flat paint brush for the heads and leaves and a round brush for the stems. Step 3 – Shade the tulip heads with Opaque Yellow as shown. You can use either a smaller flat or medium round paint brush for the shading. The goal is to create the look of petals on each head. I added additional shading here and there for dimension. If yours looks a little rough, no worries. We’ll take care of it at the end of the tutorial. Step 4 – Add highlights with White as shown. 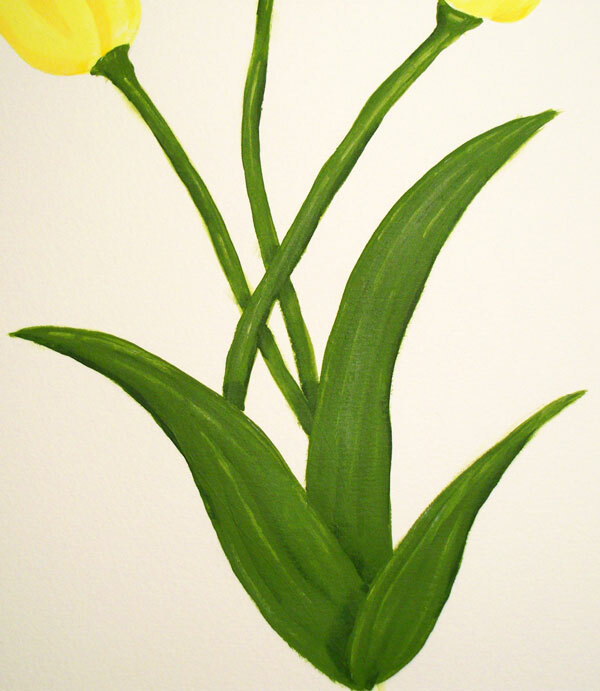 You’ll basically be outlining the petals, painting the highlight right next to the shaded portion. Again, choose whichever brush you’re comfortable with. 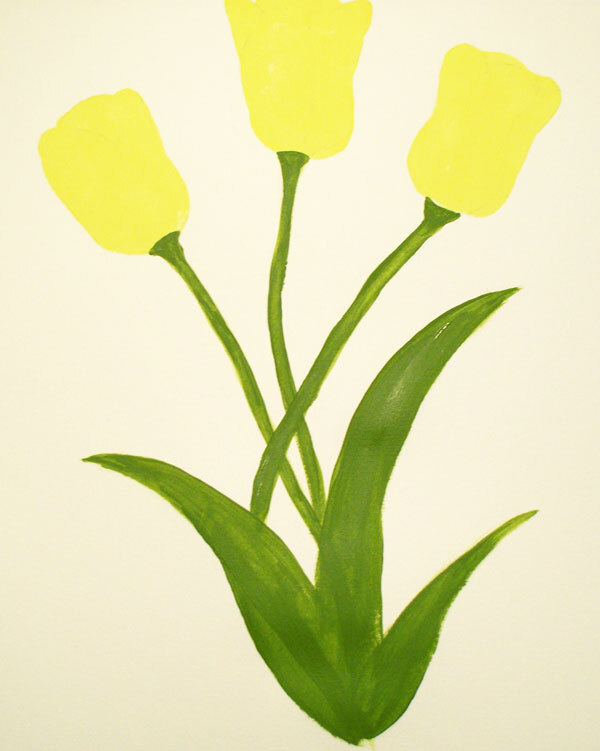 Step 5 – Shade the stems and leaves as shown with Seminole Green. 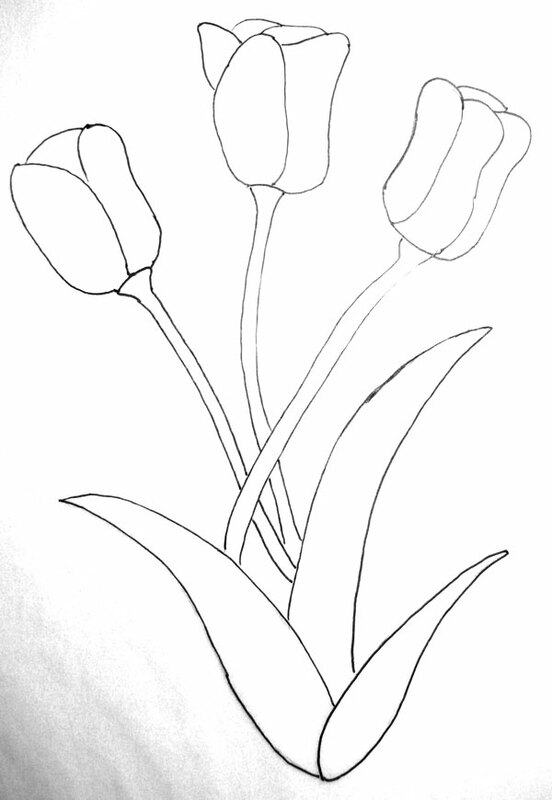 Step 6 – Highlight the stems and leaves with White in the areas shown. 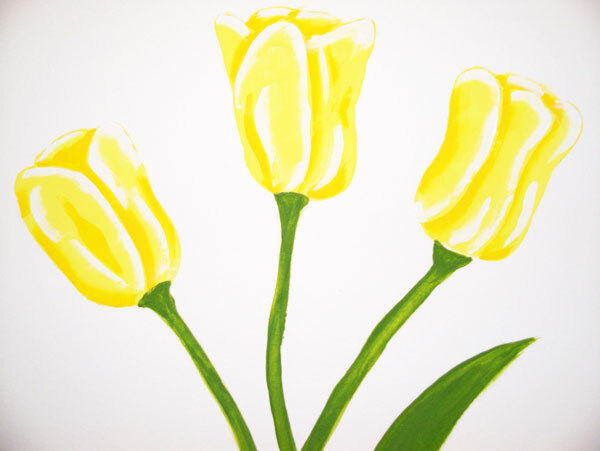 Step 7 – Topcoat tulips with Canary Yellow. One coat should be fine, depending on how opaque the shading and highlights are. Wait til they dry and then decide if you need to add a 2nd coat or not. 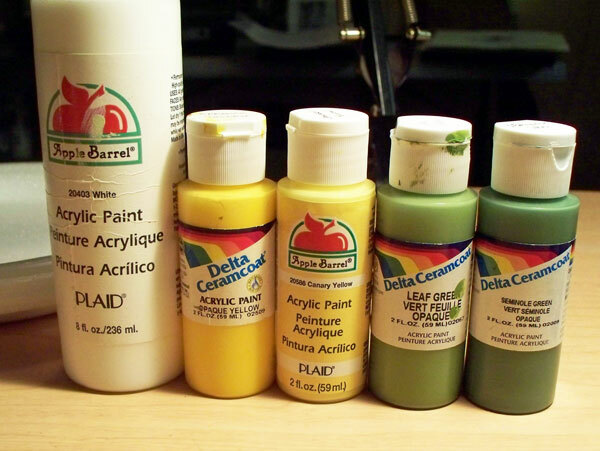 Step 8 – Topcoat the leaves and stems with Leaf Green. Allow to dry before you decide to add another coat or not. Another tip – place the painting about 3 or 4 feet away from you and then take a look at it. When we’re right on top of our paintings, they tend to look pretty messy but if you stand back a distance, they really look good! After your painting is completely dry you’ll see areas of white peeking thru as well as some shading. This is exactly what you want! This is what I call my Layering Technique. It works really well with craft acrylics. As you paint more and more, you’ll be able to control how much highlighting and shading you want. I’ve taught hundreds of beginners with this method and it’s always served us well. If you run into any problems feel free to email me at mailto:muralmaker1@gmail.com. I’d also love to see your finished painting too! The main thing is to have fun! Super cute! you do great work! I love tulips. They are my favorite spring flowers and I am so happy that we can buy them now in January. You are so talented. I’m pretty sure I could never paint like this. Thanks for visiting. Those are beautiful. 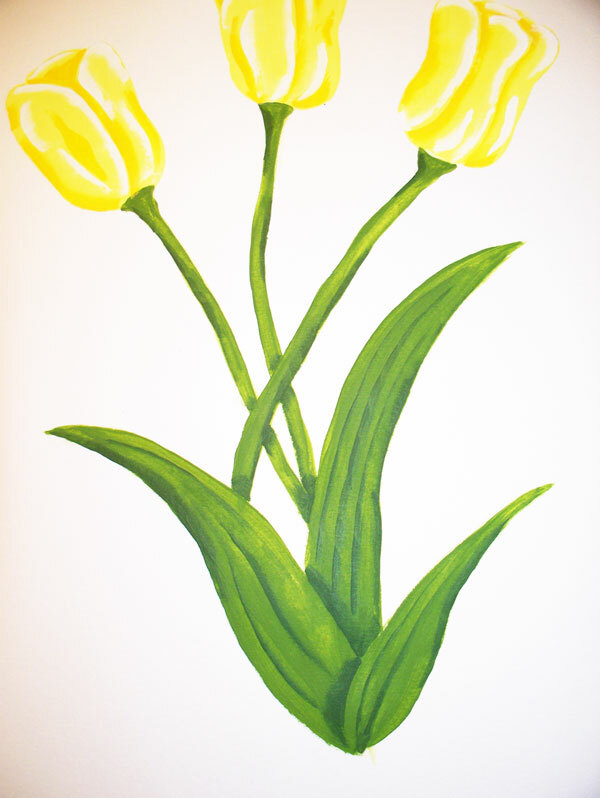 I love tulips- so brings in Spring. Thanks for sharing. 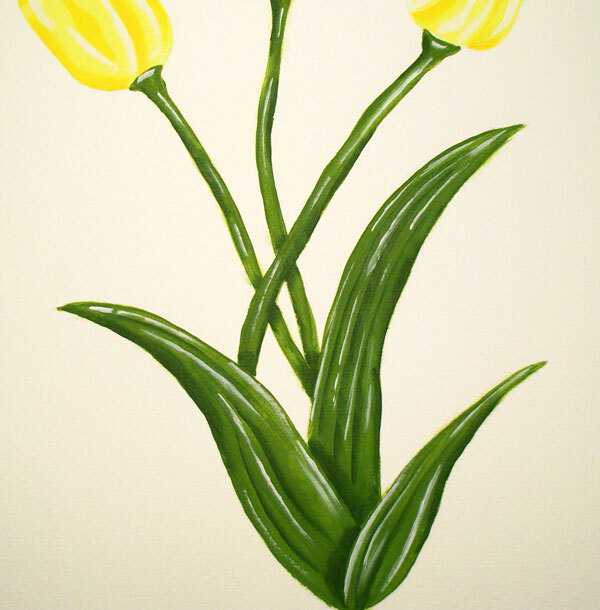 Your tulips turned out great! Thanks for the step by step! Really, you’re awesome! Thanks for bringing your beautiful link to the party this week! Once again, a beautiful painting! I always love to see what you’ll link up to the POPP.